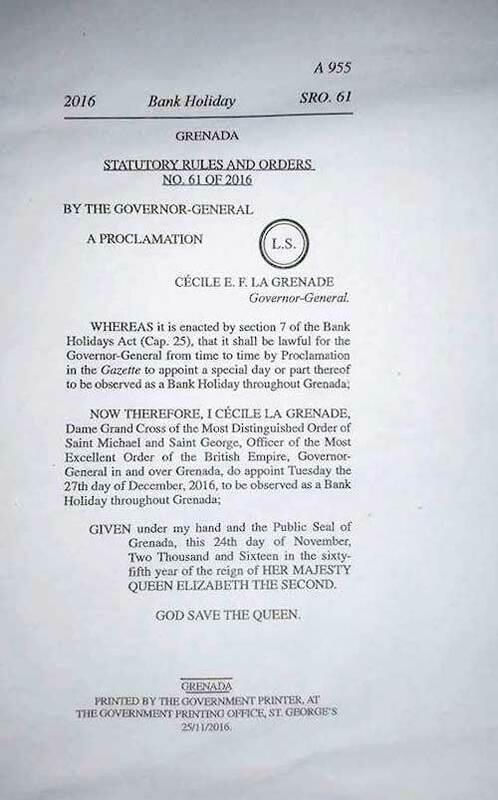 The public is reminded that Tuesday, 27 December 2016 will be a Bank Holiday throughout the State of Grenada, as proclaimed by the Governor General, Dame Cécile La Grenade. When a holiday falls on a Sunday, the day to be treated as the Bank Holiday is the following Monday. Since Christmas Day this year falls on Sunday, 25 December, and Monday, 26 December will be Boxing Day holiday, Tuesday 27 December will be given as the Bank Holiday.